Click the button below to upload your files to our secure server. I am a UK-based VA providing services to my clients including transcription work. I started on my career 35 years ago when I was awarded my first Pitman qualification (I had three before the age of 16 of 55wpm plus). I run my business and work from my own home office in Glasgow and have been self employed in this business for over 11 years. I undertake audio and video transcription from just about every format. I am excellent with accents. As a professional virtual assistant, I have Professional Indemnity business insurance (certificate attached) and I am fully compliant and registered with the Information Commissioner’s Office as a data controller. My usual turnaround time is 2 x working days, so anything arriving with me, say, at 9am on a Monday (or over the weekend), I will have back to you for 9am on the Wednesday. I can turn work around faster than this if you have something that is urgent, so please message me and ask! I have my own transcription templates, but if you prefer me to use yours, that’s fine. 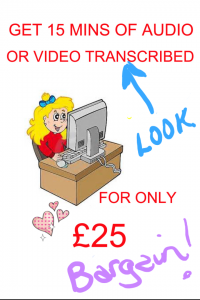 Please note, the industry standard for transcription is, for one speaker, clear audio, no strong accents or industry wording, a 15 minute piece of audio will take one hour to transcribe. If you have multi-speaker (more than 3 speakers) audio, please message me for a price. Otherwise, please buy 1 hourly from me for every 15 minutes of audio. If you have any questions at all, I would be happy to answer them.